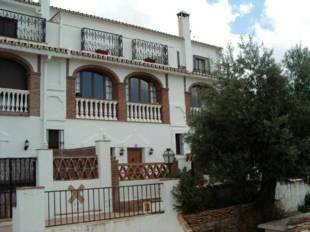 Situated right in the heart of Mijas Pueblo, just off the main street. Property consists of 3 bedrooms and 2 bathrooms, 1 being en-suite, downstairs cloakroom, fitted kitchen and roof terrace with lovely views. With regular bus services to Fuengirola there is no need for a car. This lovely townhouse is part of a small well kept community sharing manicured communal gardens and large pool area. The house it self has been updated and extended by the present owners and makes a perfect home for younger families as well as a great vacation retreat.The +50 m2 terrace enjoys spectacular sunsets and views over the white village of Mijas, the breakfast terrace has the morning sun!Lock up garage and off road parking. 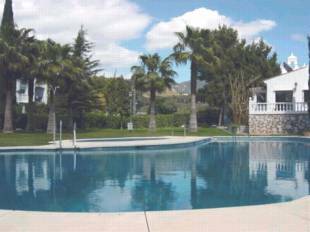 Nearby access to public transport and minutes from Mijas , Fuengirola and Benalmádena. 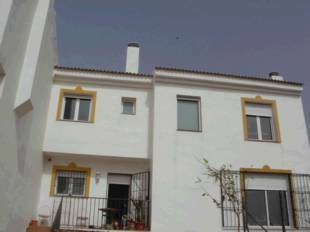 A family townhouse in a small urbanization 2 minutes from Mijas Pueblo. Feature courtyard garden plus small terrce leading to community garden and pool. Basement of 80sq m. which may easily be converted to Granny flat. Tennis, Bar and Mini-market nearby. Lovely two bedroom, two bathroom townhouse with two large sunny terraces. This property has beautiful sea and mountain views and the community offers a good size pool and very well maintained gardens. There is an underground garage. 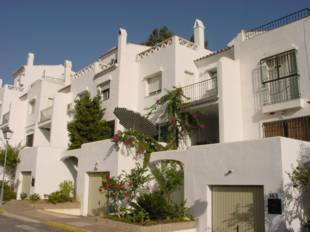 Cosy and very well located 2 stories townhouse in a sought after complex, very tranquil and childfriendly with a fantastic view of Mijas and the mountains. Comprising of hall, guest toilet, lovely bright and delightfull living room with fireplace and access to terrace with fantastic views, also access to terrace and private garden, almost new fully fitted kitchen. First floor with three good sized bedrooms and two bathrooms. The property also has a large roof terrace, private garage, air conditioning and satellite TV. 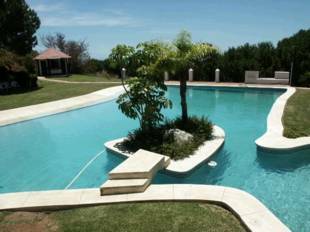 Large communal garden with large swimming pool and a pool for the children. The townhouse is 100m2 with a terrace of 27m2 plus a roof terrace on 29m2 also a garage of 18m2. Can first be taken over 1. of may 2006. 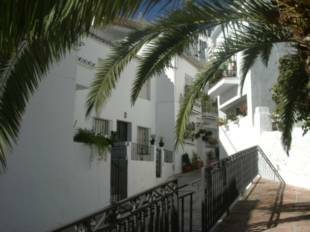 Lovely newly reformed townhouse in the Mijas area on three floors with quality fixtures, jacuzzi and solar panels. 3 bedrooms, 2 bathrooms, large living room with an open terrace with panoramic views to Fuengirola & the sea. Sold fully furnished and has a communal swimming pool.